Last week I did a webinar with Jeanna Pool, the Amazon #1 best selling author of Marketing For Solos. And we were talking about the normal stuff, blah, blah, blah, you know the usual marketing on Pinterest stuff, then I made this comment and it totally caught her attention and she asked me too explain what I was talking about – and show her the details because she had never heard Pinterest explained ‘that way’. Doesn’t that make sense? And if you do, there are infinite possibilities that come to your mind. Pinterest – a cascading collection of Display Ads? 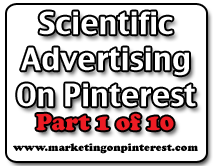 If so, you’ve just begun on your journey toward scientific advertising on Pinterest. Of course we’ll be guided by classic gurus on this journey like Claude Hopkins and his great book, My Life In Advertising, and other advertising masters too. Stick around.